What is a Home Energy Audit and How Can it Help Me Save Money? Getting an energy audit done on your home can help you make smart renovations to your home that provide value for your money. Improving the energy efficiency of your home will make you and your wallet more comfortable, and it's easier than you think! A home energy audit assesses how energy efficient your home is. It is performed by an independent home energy advisor, who inspects your home in order to evaluate the heating and insulation characteristics. Home energy advisors are specially trained to perform this evaluation, and are licensed by Natural Resources Canada. During a home energy audit they will examine the performance of your home's heating, insulation and air leakage, hot water, and ventilation systems, and will offer appropriate (cost-effective) energy efficiency improvements and upgrades. After the evaluation, your energy advisor will provide you with a written report of the results of the home energy audit. The home energy advisor will conduct a walk-through assessment of your home in order to gather necessary information for evaluating its efficiency. First, the home energy advisor will take some measurements and pictures of your home from the outside. Then he or she will look at your furnace and basement, and will examine the age and performance of your furnace and water heater, as well as the level and quality of insulation in your basement. The home energy advisor will also look at other appliances throughout the house, such as the toilets, kitchen appliances, lighting, etc. He or she will also examine your attic, and in particular how well-insulated it is. 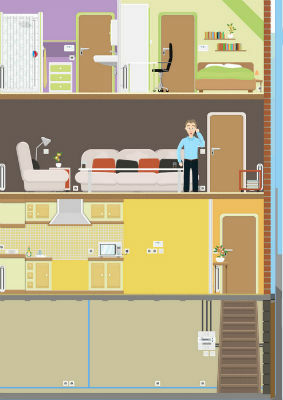 Having examined the house from basement to roof, the the home energy advisor will detect any drafts ("air infiltration"). This is often done by a "blower door test", in which the technician will hook up a fan in the house to put it under reverse pressure. This test allows the advisor to find the exact points in your home where sealing is needed (areas where there are significant air leaks). The blower door test equipment is specially designed to fit into any exterior door opening. It includes a variable-speed fan that is mounted on a n adjustable panel. When turned on, the fan draws air through your home at a constant speed so that it reaches a certain (constant) pressure. This allows the advisor to measure how much leakage takes place within your home, and identify where the drafts are. Once the inspection has been completed, the energy advisor will create a report that breaks down how much energy your home uses for space and water heating, lighting and other appliances, and identifies where in your home energy is lost (windows, doors, basement, attic, etc). Your home energy advisor will explain the results of the report to you, and will answer any questions you might have. The report will identify which energy upgrades would be the most cost effective. Your home will also be compared with similar homes in the NRCan database so that you can see its relative efficiency. It will receive a current rating and a predicted rating for the suggested energy improvements. Why Get a Home Energy Audit? Getting your home evaluated for its energy efficiency will enable you to identify the most cost-effective improvements you can make to improve its energy efficiency, which will lead to reduced monthly energy bills, environmental impact, and general operating costs. Improving your home's energy efficiency will also increase your personal comfort, as well as the durability of your home and its resale value. The EnerGuide energy efficincy rating that your home receives is a standardized and objective measure according to the Government of Canada. You can promote the energy efficiency rating of your renovated home if you decide to sell it. Where Can I Find a Licensed Home Energy Auditor? NRCan has a list of licensed NRCan home evaluation service organizations. Energy audits generally cost a few hundred dollars, but may be eligible for government rebates. Check with your local municipality or provincial government to see if you are eligible for a rebate if you have a home energy assessment performed on your house.